Disclaimer: This post contains affiliate link’s from which I may get a commission. However, my opinion’s are purely my own! Black is back, so to speak, and it is the “new gray.” In fact, I’m not sure if it ever went away, but now it’s trending! What in the world does that mean? You may have heard me talk about how design trends tend to cycle through about every decade. 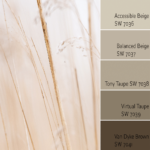 In fact, I recently wrote a post addressing how to transition your home from the “Tuscan” trend towards more of the “Gray” trend using some of my top specified neutrals. So, hear me say that gray isn’t totally going away. However, black is slowly seeping into US interior design. Typically, trends starts in Europe through fashion that eventually find their way to architecture and interior design. It takes some time to kick into full force, but black has been spotted more lately in design and it is quickly picking up speed! Truth be told, black (and white) in interior design will always be “in style,” because it’s so classic. A perfect example is the inspiration picture below. When was this home designed? I have no idea, because black and white marble floors are timeless. When in doubt, go with black and white. You can’t really go wrong! Quick, grab a t-shirt and have it monogramed with “Black is the New Gray.” You will be the coolest thing since since sliced bread. Ha! But, in all seriousness, I wanted to take some time to feature interior and exterior design inspiration leaning towards the newest black trend. I will work my way from the outside (exteriors) to the inside (interiors) featuring inspiration pictures along with my feedback. 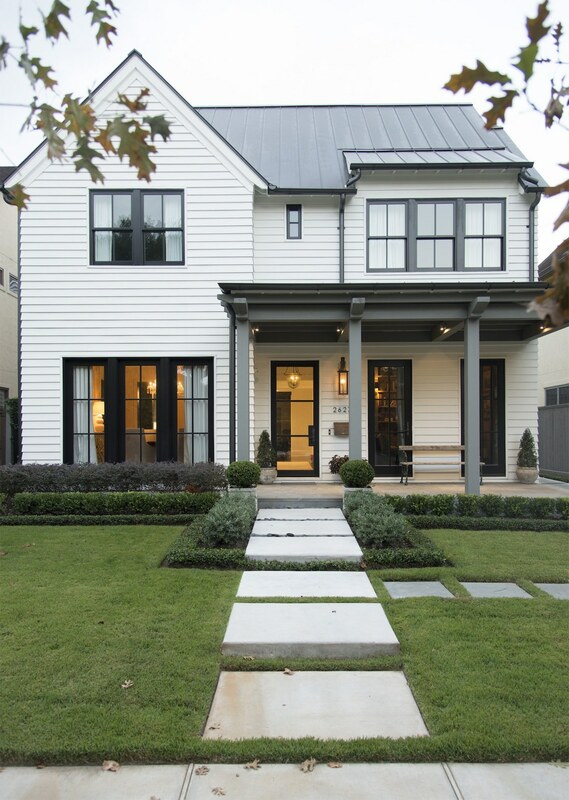 Black accents on exterior from Gardenista. This is really the first place that I started seeing more of the black trend appear. Modern farmhouse style is all the rage right now (thank you, Chip & Jo! ), so it makes sense that black is popping up as an accent in exteriors. When I wrote my post on front doors, black was up there with the most popular colors. Black as exterior trim from Studio-McGee. Black can currently be seen in exteriors mainly as an accent in shutters, window trim and doors contrasting against an all white exterior. 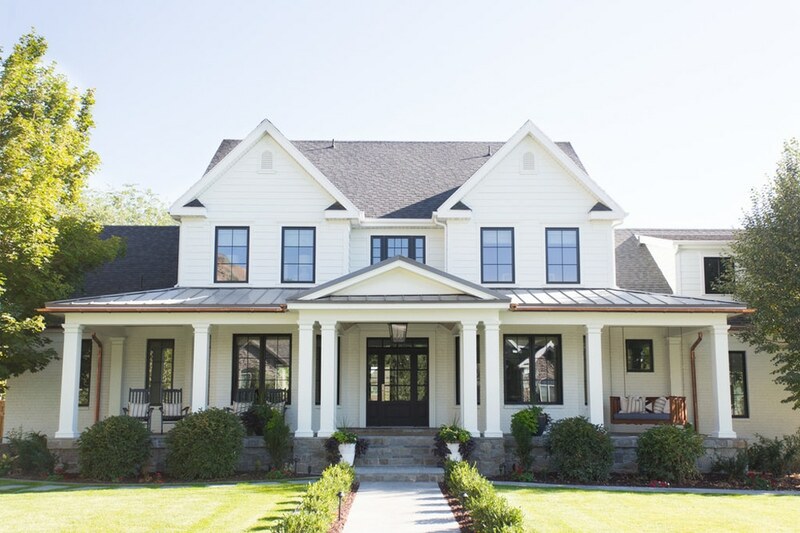 This is my favorite look for black on exteriors: brick and siding painted in a bright white with black used mainly on door and window frames, along with a black roof. The design is clean and modern, but at the same time, superbly classic. Black window trim from Garden Studio Design. 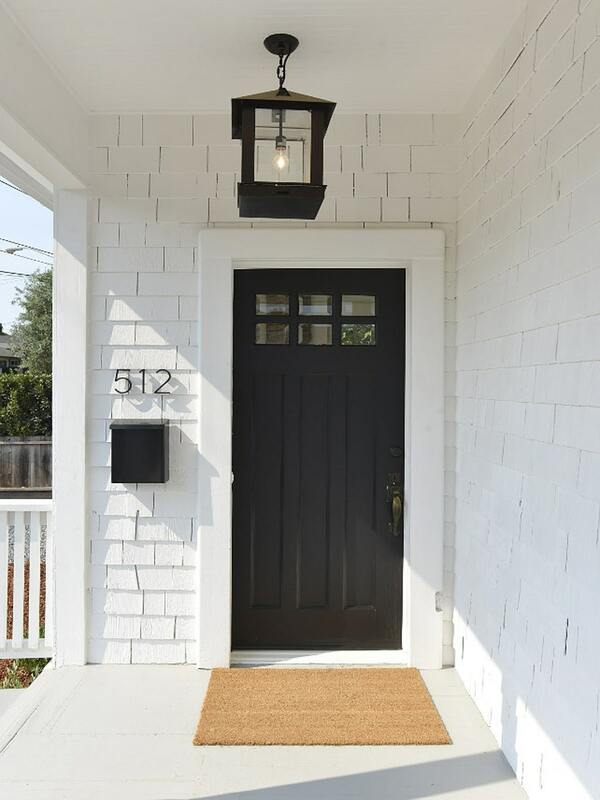 One easy way to incorporate black into your exterior is to paint your front door. Since black is a neutral base color, it really works with most exterior colors, (except maybe navy). 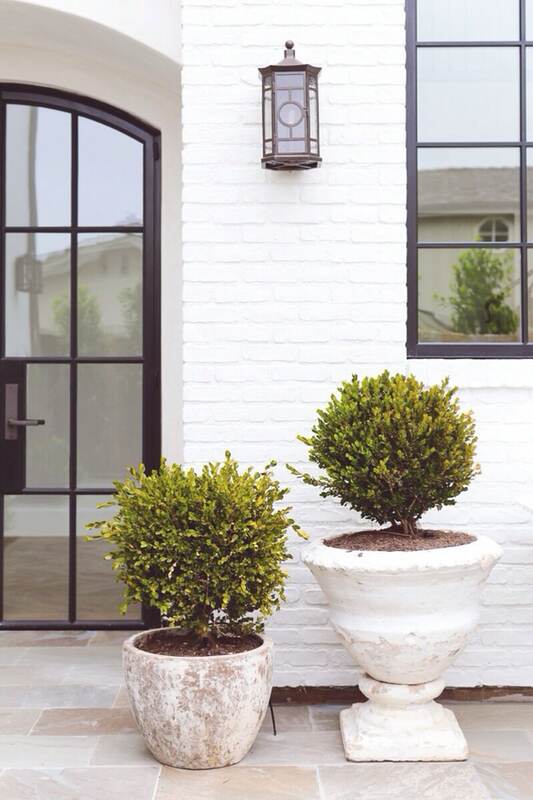 If you are looking to add some dimension and interest to the classic black and white exterior, consider using texture. Using natural/rustic wood for shutters, trim and/or front doors is one way to add some warmth and texture to a basic black and white exterior and is a nod back to the farmhouse style. 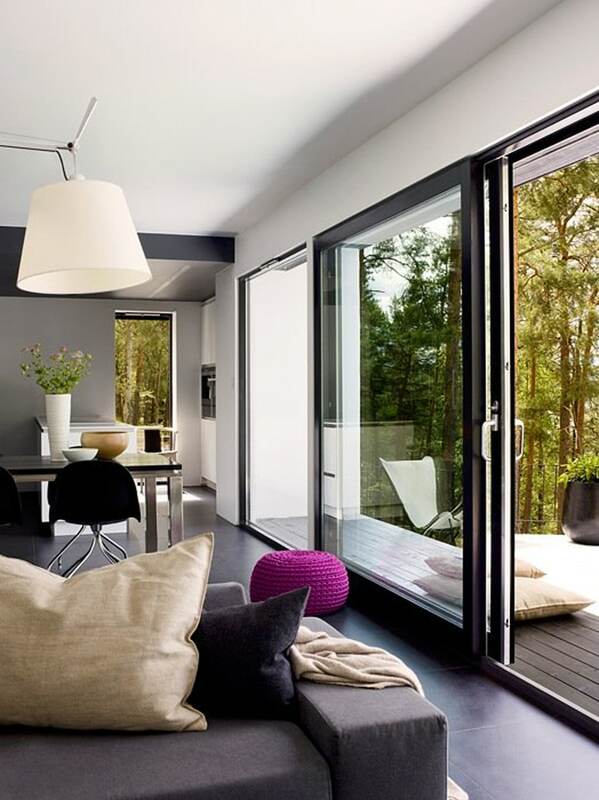 Now, moving into the interior of the home for some “black trend” inspiration. This can be a bit more tricky than exteriors. Take a minute to think through your design goals and style. If you are already going in the modern farmhouse direction, adding black to your interiors might work best using it for accents in furniture and artwork. If you are going all out for a modern style, casing your window trim and doors in black is one big way to add drama and sophistication. 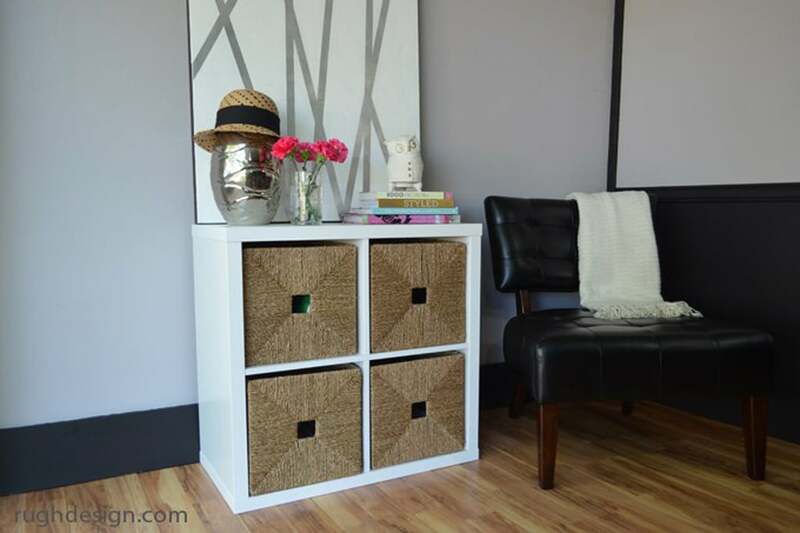 This looks best (in my opinion) with white or off-white walls for a clean and crisp feel. 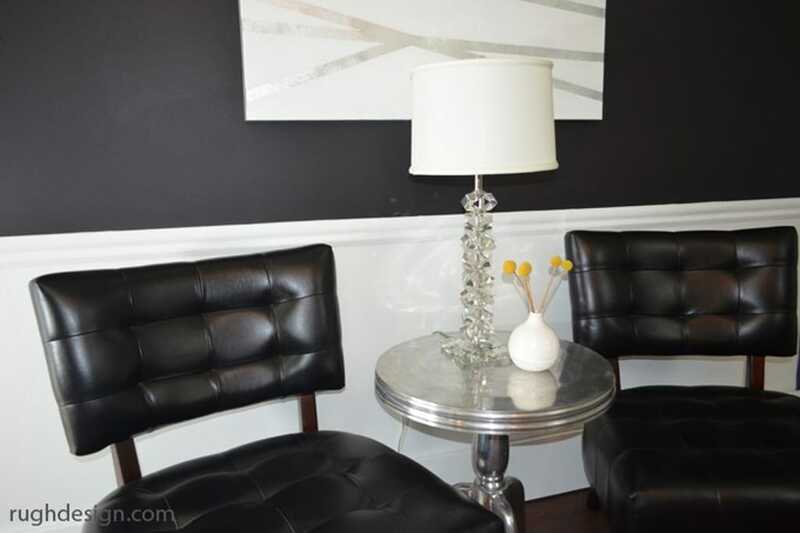 Let the black trim be the main focus and add color and texture through furniture, lighting and other accents. Black interior trim with black accents from Ragnar Hartvig. One more way to add some contrast in a concentrated way is to paint your trim (baseboards, crown molding and/or chair rail) in a matte flat black. 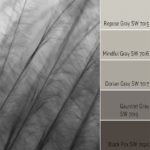 I did a color review on the Sherwin-Williams popular black, Caviar (SW 6990) awhile back. I painted the trim and chair rail for my styled photo shoot in Caviar. The wall color was Fashionable Gray (SW 6275) and I LOVED the results. This is a super easy way to use black in a focused way by doing this in one room versus painting your entire house trim in black! Don’t be afraid to go all out and use black for your wall color too! This is trending and in fact, the House Beautiful issue from February 2018 featured a study with black grass cloth walls on its cover. Naturally, white furniture, white drapes and artwork contrasted with it flawlessly for a crisp and chic interior. 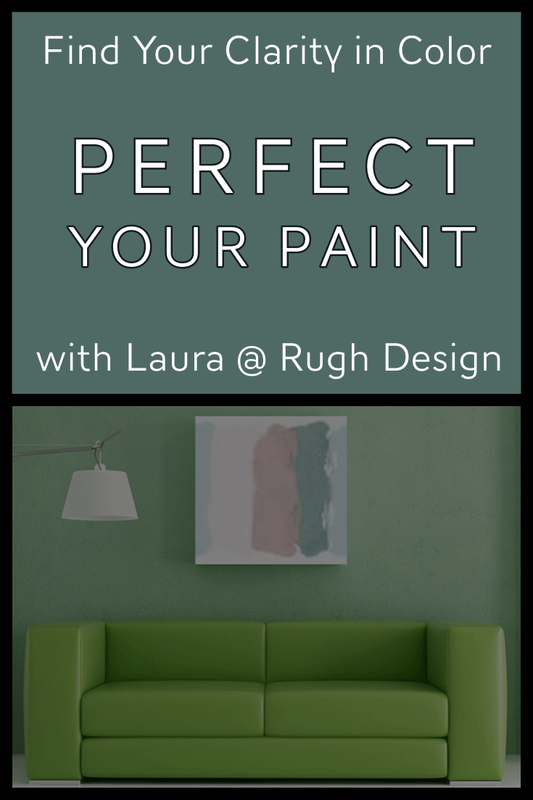 If you are not feeling super brave or don’t want to paint a whole room in black, painting one wall as an accent is a great way to “dip your toe” into the black trend. Black interior with white accents from House Beautiful. Looking for a way to add some black into your interior in more of a subtle way? It can be done! When I was working on my photo shoot for the Caviar color review post, I painted the wall above the chair rail only in Caviar. The chair rail and the wall below it were painted in Extra White (SW 7006). This is a great way to add the drama of black without it saturating the entire room or an entire wall. One of the predominate interior spaces that I have noticed black being used in is kitchens. And, oh man, is it gorgeous! I am pretty much dying over how this kitchen in the inspiration picture from Traditional Home turned out. Okay, that is a bit dramatic, but it is inspiring. The cabinets are painted black with white subway tile and quartz countertops that creates an interior palette with an ageless appeal. I love the brass hardware and brass lighting that add some gleam along with the surprise graphic wall covering on the ceiling! Black kitchen cabinets from Traditional Home. Pretty much opposite of the previous kitchen inspiration, the interior below uses black countertops, black window trim and the black hood vent/stove for more of an accent. 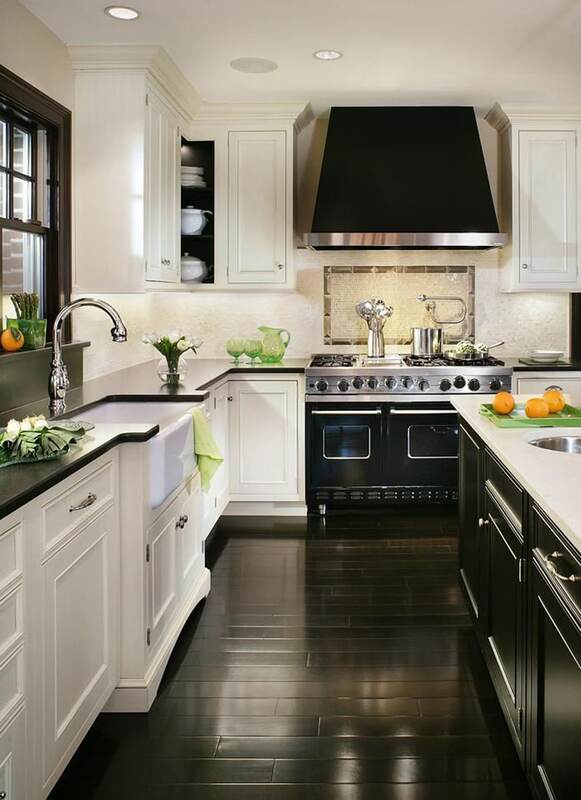 If you notice, the designer switched up the island by doing the lower cabinets in black and the countertops in white. This is a great way to integrate some charm into the kitchen and to add some interest. I’ve seen contrasting islands a lot lately and I love it! Black accents in kitchen from HG Sphere. Possibly my favorite place to use black is currently in bathrooms. 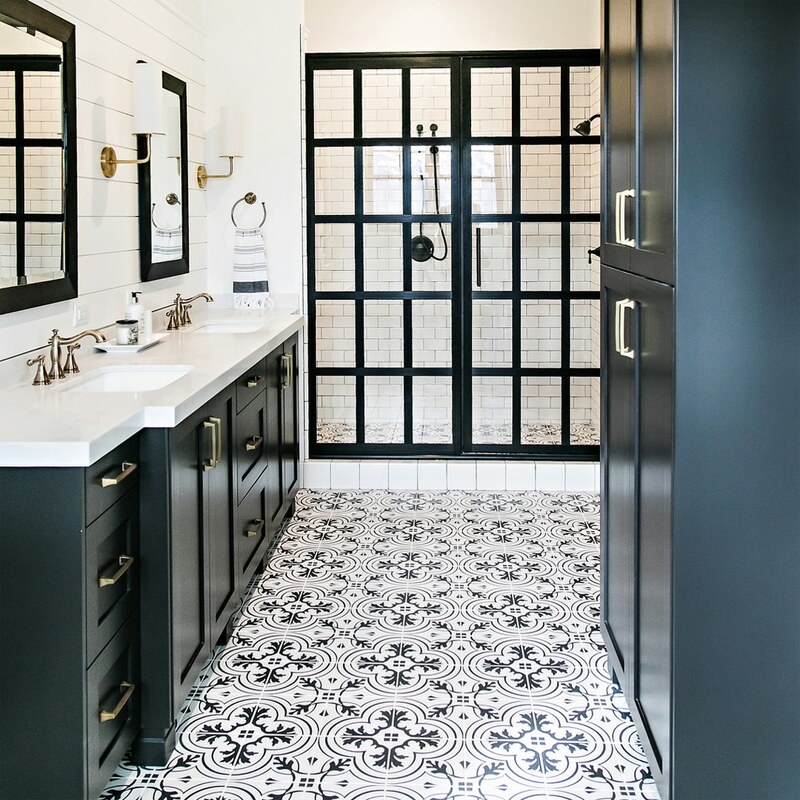 Goodness, I adore the black framed shower doors. I mean, it looks like you are walking through fancy french doors, instead of merely entering the shower. Not to mention how much fun you can have with pattern in bathrooms. Shower tiles, floor tiles, the sky’s the limit with patterned tiles! 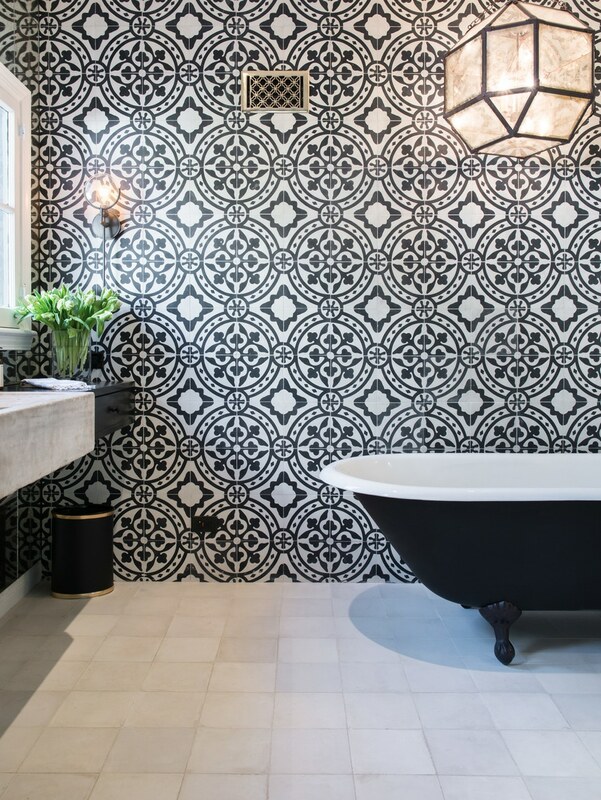 I am loving the black and white Moroccan patterned tile decals that have me all heart-eyed. Along with shower doors and window trim, black tubs are also stealing the show. How unique and special is a black based claw-foot tub? I love it! And really, it’s ageless because, hello, it’s a claw-foot tub that won’t ever go out of style. Black claw-foot tub from Byrd. Okay, okay. I know what you are thinking and I’m honestly in the same boat. It may not be in the budget to purchase a claw-foot tub or black framed shower doors. 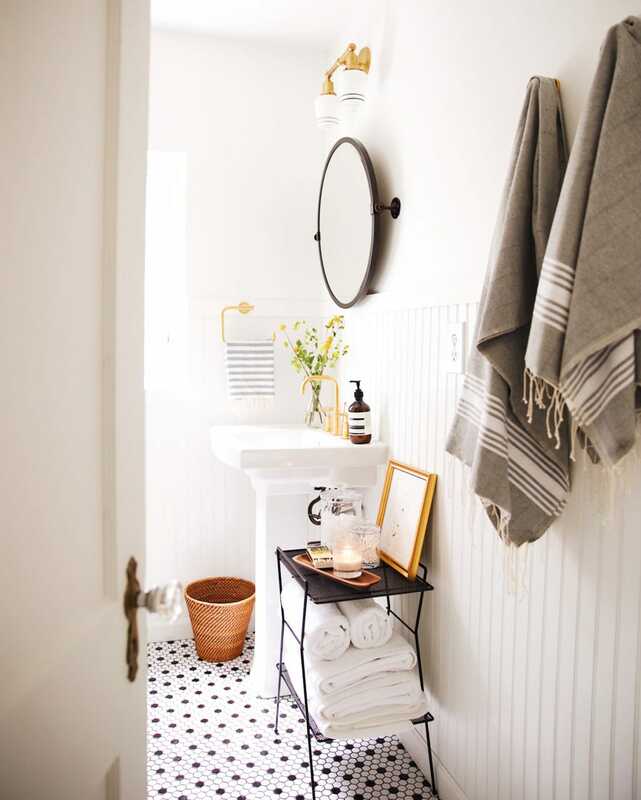 However, it is possible to add black to your bathroom without breaking the bank. One simple way, is to paint your cabinets in a either a shiny or matte black. 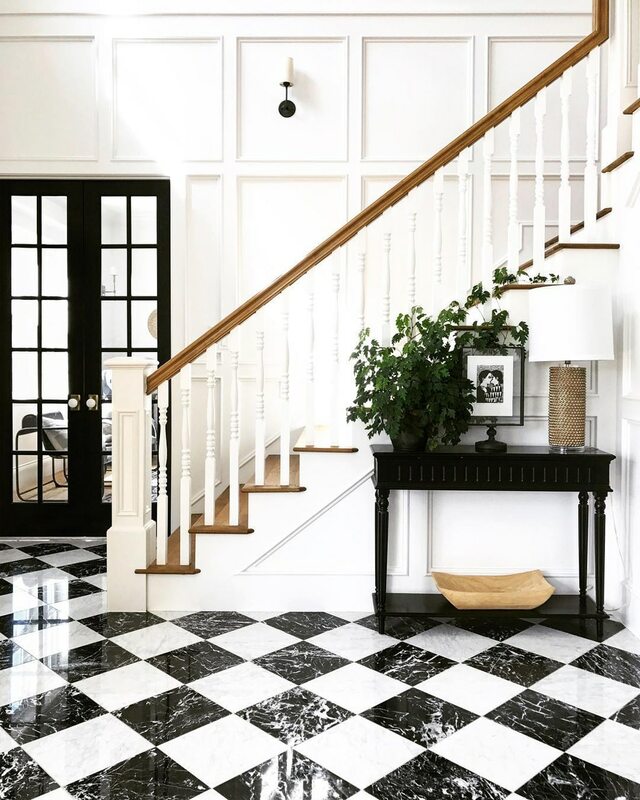 Also, the classic black and white hexagon tile is not only affordable, but can also be found in older homes. Just another example of how timeless and classic black and white is! Black tile bathroom floor from New Darlings. Last, but not least, is adding black into your interiors through accents in furniture, artwork and accessories. This is super easy to do and another way to stay on trend with black without spending a ton. First, classic black framed artwork will never go out of style and can be a simple addition to your wall decor. I still love the popular gallery wall with frames that are all the same color showcasing family photos or unique artwork. Also, adding framed art to a black picture frame ledge is a perfect way to bring in some black accents. 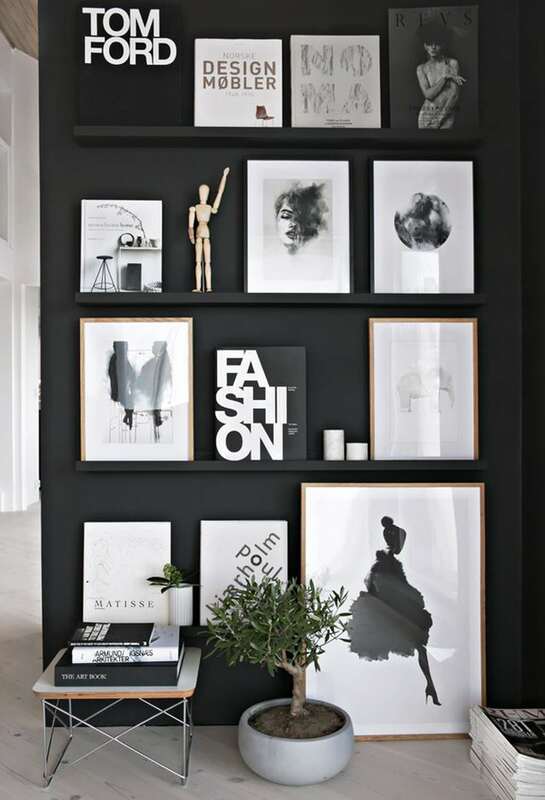 Black wall with black-framed artwork from Stylizimo. Black and white patterned pillows can spice up any sofa or chair and help add a graphic look to your living room decor. Matte black lighting and hardware are yet another way to add black in a space through accents. Y’all, my last idea might be my fav: self-adhesive removable wallpaper in graphic black and white patterns! Did you catch the “removable” part? 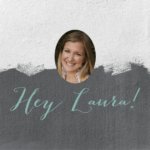 This is perfect if you are feeling non-committal or are living in a rental that has decor limitations. You can find multiple patterns through patternsCOLORAY on Etsy. 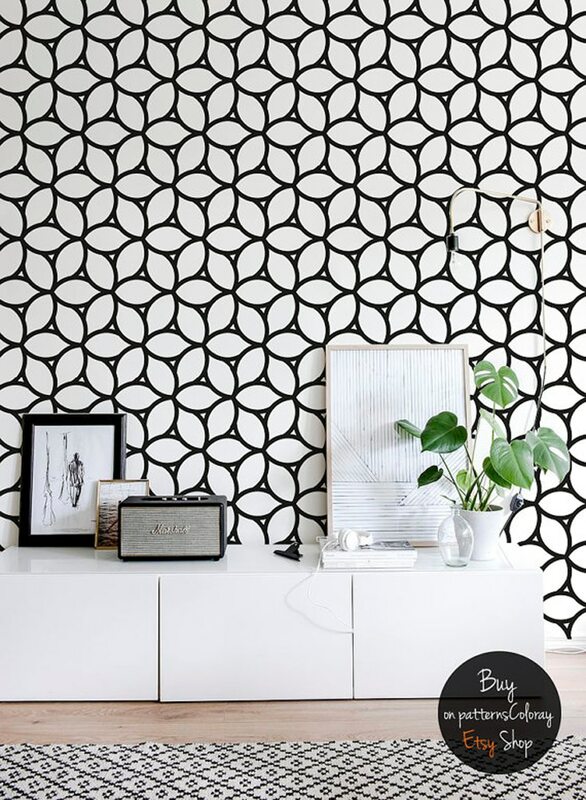 Black patterned peel & stick wallpaper from Etsy. 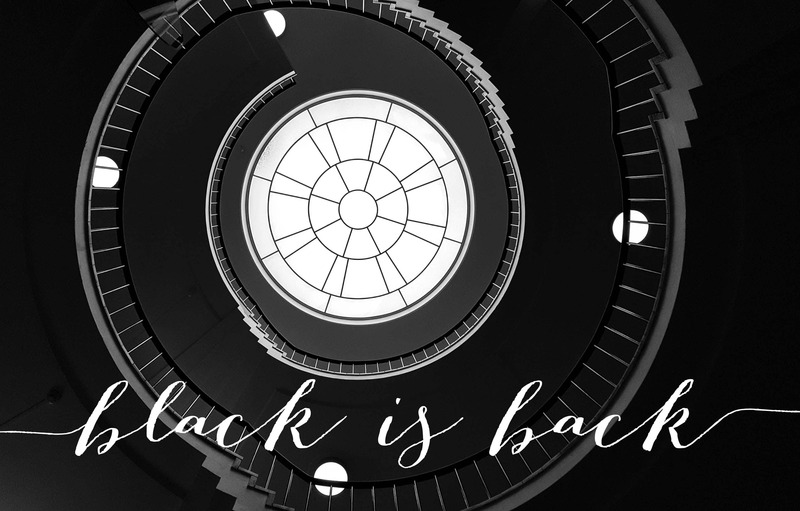 Black really is back in a big way! Like I mentioned, black will never go out of style, so don’t be afraid to be on trend and timeless at the same time. I created a Pin Board with tons of black and white inspiration if you are looking for more visuals. 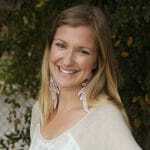 I would also love to hear from you! Send me pictures of your home or share ideas that you may have to add some black to exteriors or interiors. My hope in writing this post and featuring inspiration pictures is to give you the ideas and tools that you need to get started on your own. 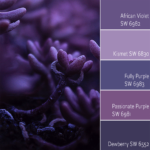 If you are still feeling stuck, I would love to help you find a color for your home through a Color Consult or create a custom shopping list through my eDesign services. Seriously, this is what brings me joy! I love meeting new people and having the opportunity to help them transform their home into a place that is not only beautiful, but reflects who they are.